Quilting Suggestions for Diamond Ring?? Thread: Quilting Suggestions for Diamond Ring?? So I've finished the top for my parents' 60th Anniversary quilt, pin-basted it, and now I'm stuck. It's been nearly a year and I really want to get this done. I plan to outline all the rings, and probably the diamonds in all the arcs too. I just can't decide what to do in the ring centers. 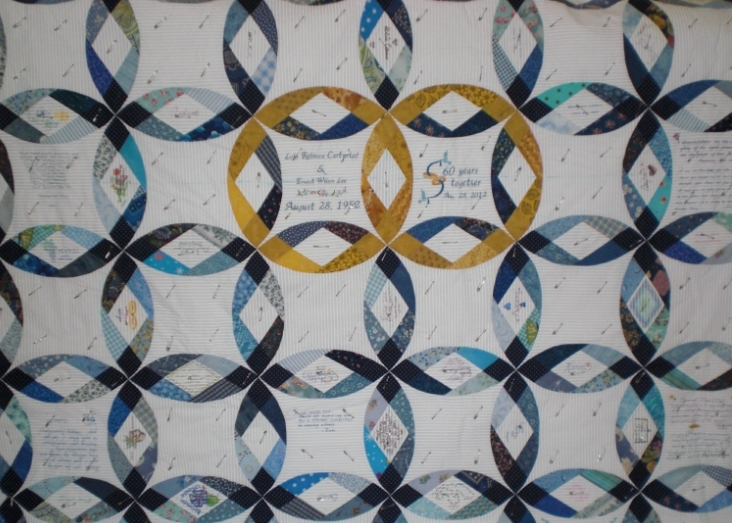 The quilt on the pattern leaflet was done with diagonal lines that formed an "X" in all the centers. I am not sure I want to do that since nearly half the centers contain signatures or messages. I am afraid it will obscure the writing. But it will definitely need some quilting in those large center sections. I have considered invisible nylon thread, but it's not my first choice. Any ideas? Thanks for your input! A small heart with cross hatching around it? No suggestions on the quilting, but that is a spectacular quilt. I've never seen that pattern before. What a beautiful pattern, you have done a wonderful job!! I like the idea of a feathered heart!! Very pretty! The only thing I can think of without messing up the writing, is underlining the text every other line? You could also meander with invisible thread, for some reason meandering to me looks like a non pattern and I don't really notice it. No quilting suggestion but wanted to say what a lovely quilt! Congratulations to your parents, too - that is quite an achievement! I don't know, but that is one gorgeous quilt! There are quilting stencils especially for the wedding ring. If you are concerned with quilting covering the lettering I would do a test sample to see. It definitely needs quilting in the centers.